Many Columbia homeowners enjoy hardwood flooring because of the warmth it adds to homes’ interiors. Whether you buy a home with existing hardwood flooring or you hire a painter for hardwood flooring installation and refinishing services, you’ll have to take good care of your hardwood floors, so reviewing maintenance and cleaning tips is a productive use of time. Rugs – Place rugs in doorways and frequented areas of your home, such as the kitchen and hallways. Rugs will protect your hardwood floors from considerable wear and tear. Furniture Polish and Hair Spray – Disperse furniture polish and hairspray with caution because these products can leave a layer of grime on hardwood floors. Felt Floor Protectors – To prevent scratching, place stick-on felt protectors on the bottom of the legs of your furniture. Replace these felt pads periodically because they collect debris. Sand and dirt adhere to the felt protectors and can scratch the flooring. Water – Humidity and moisture can be very damaging to hardwood floors. Warping and water stains develop if hardwood flooring is exposed to excess moisture. Shoes – Avoid wearing shoes with abrasive heels. Consider limiting the amount of shoe wearing in your household to protect the finish of your hardwood floors. Spills – If you spill any liquids on your hardwood floors, wipe them immediately with a slightly moist cloth. Vacuuming – Homeowners are urged to vacuum their hardwood floors at least once a week because fine grains of dust and dirt will damage the floor’s finish as people walk around. Make sure to use a brush or felt vacuum attachment because these attachments are gentle on hardwood surfaces. Sweeping with a dust mop or microfiber sweeper will serve the same purpose as vacuuming. Mopping – After vacuuming or sweeping, use a gentle hardwood floor cleaner to mop. Because hardwood flooring doesn’t react well to water, wring the mop almost completely dry before cleaning. If the humidity level is high, make sure to turn on the air conditioner or a fan to dry the floors quickly. Your painter will probably recommend that you vacuum or sweep weekly and mop monthly. Hardwood flooring’s polished appearance will diminish over time. If your hardwood floor is over ten years old, consider hiring a painter to sand and refinish your flooring. Refinishing is more affordable than new hardwood flooring installation, but if the damage to your hardwood floors is severe, installing new hardwood floors may be the best course of action. 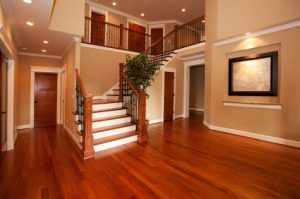 If the hardwood floors in your Columbia home are looking dull, reach out to an experienced painter at Annapolis Painting Services, and schedule a hardwood flooring installation or refinishing.